The ultimate TrueStrike™ is the Double Golf Mat and is aimed primarily at golf professionals and driving ranges, but if you have the space it’s also fantastic for home golfers too. To hit off a golf mat that "feels" like a fairway has been every golfer's dream; especially when the weather takes a turn for the worst. Finally a golf mat comes close to recreating that same feeling you have when taking a divot out of the fairway! Both left and right handed golfers can enjoy the full TrueStrike™ experience without any configuration changes required. 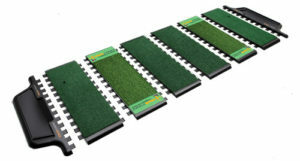 Every golfer from amateur to expert can benefit from practicing with TrueStrike™ Double Golf Mat. The core fundamental design of TrueStrike is fiberbuilt to last and react like grass when hit, allowing golfers to have a realistic practice so they play like fairway pros out on the grass. The TrueStrike golf mats have a “ruckable” top surface and a gel-filled divot simulating subsurface which accurately recreates the effects of playing off a natural fairway by allowing the club head to play through the playing surface as it would on turf. Very pleased with my new TrueStrike single mat, I tried one at my local driving range and fell in love with the realistic feedback and performance. I was amazed more retailers don�t sell them.